As Obama Admin Seeks More Funding for Charter Schools, Questions Raised over Billions Already Spent | Democracy Now! "New Documents Show How Taxpayer Money Is Wasted by Charter Schools"
JUAN GONZÁLEZ: With the Obama administration asking Congress to increase funding for charter schools by almost 50 percent, we turn to a major new report that claims charter schools are already spending billions of dollars of federal money with nearly no oversight, regulation or accountability. The report was released by the Center for Media and Democracy, and it’s called “New Documents Show How Taxpayer Money Is Wasted by Charter Schools.” According to the report, the federal government has spent more than $3 billion over the past two decades on the charter school industry, but there is no comprehensive database showing how those funds are spent and what results they produce. AMY GOODMAN: The new report analyzes materials obtained from open records requests regarding independent audits of how states interact with charter schools and their authorizers. It concludes that the anti-regulatory environment around charter schools, coupled with their lack of financial transparency, warrants a moratorium rather than increased charter funding. Lisa, welcome to Democracy Now! Lay out the key findings of your report. LISA GRAVES: Thank you so much. We spent quite a bit of time trying to figure out how much money has even been spent by the federal government fueling this industry. And it turned out the sum is $3.3 billion. And so, we thought, with that much money at stake, there would be tremendous controls on that spending. But our open records requests showed time after time in which the federal government and the state governments have no idea how that money is being spent. And that, in part, is due to the—pardon me—design of those schools. The design at the state level, driven by ALEC, the American Legislative Exchange Council’s policies and a number of sort of extreme policies represent a real hostility to government schools, to the idea of public schools and government oversight. And so, what we saw in our records requests was time after time in which no one really knew how much money was being spent by the schools, how much of those tax dollars was being spent on executive pay, how much money was being outsourced to for-profit corporations. But we know that this $3.3 billion have fueled an industry that now devotes millions of dollars each year to lobbying for more charter schools, and devotes millions of dollars advertising on public airways for people to send their kids to charter schools, things that public schools don’t have a chance to do. Public schools don’t have the budget to advertise their benefits. Even though these things are called public charter schools, in many respects these operate, in many instances, for the private sector, for the benefit of CEOs and Wall Street. JUAN GONZÁLEZ: Well, Lisa, one of the things that your report highlights is this black hole of accountability when it comes to charter schools, that the federal government is not holding the states responsible for the money it gives to the states for charter schools. The states are not holding their own charter authorizing agencies or even the individual charter schools accountable. And you conclude that this was not by accident. LISA GRAVES: That’s right. You know, one of the things we’ve seen over and over again are promises by the Department of Education to do more to hold charter schools accountable. But what you see on the ground, based on the audits, based on the inspector general’s report, is a real lack of controls. You basically have the Department of Education’s charter operation sort of encouraging the states to do more. Meanwhile, you have audits that show that in many instances the states have no idea where the money was spent once it went into the charter school system. They don’t know how many kids were really served. They don’t know what happened to assets that were purchased through our tax dollars. And there’s a recent report last week from the Center for Popular Democracy that shows, through looking through federal and state criminal fraud indictments, that there have been more than $200 million worth of fraud in the charter school industry. And so, this sort of circumstance calls for much greater control, much greater restraint, rather than the 50 percent increase that the administration has called for for charter school funding. AMY GOODMAN: Lisa, I wanted to turn to a mother featured in an ad released by Charterswork.org. MOTHER: I had the potential to be great, but no one helped me to identify that. I was not letting that happen to my kids. Public charter schools provide a high-quality education right in our community. I have a daughter that attends Achievement First Apollo, and there’s no limits for her now. I voted for de Blasio, but I didn’t vote for you to take my child’s future. AMY GOODMAN: So there you have it, and, of course, they’re talking about de Blasio, the mayor of New York City, Mayor Bill de Blasio. But, Lisa Graves, what about this? And what about the success of or failure of charter schools overall? LISA GRAVES: Well, you know, the studies that we’ve looked at—and we’ve looked at a huge range of them—show that overall the charter schools don’t perform better than the public schools, the traditional public schools. And, in fact, in the worst circumstances, the charter schools perform far worse. You also can see circumstances in which in the so-called virtual public schools, where the dropout rates are higher, the failure rates, in essence, are higher. And so, while people can point to examples here and there of success or innovations, the overall studies seem to indicate that we’re siphoning a lot of money out of our public school system to these charters, and some people are getting really rich off of it. Some of these for-profit corporations are making millions—in fact, hundreds of millions—of dollars out of our tax dollars, and turning around and spending that money to lobby for more tax dollars, and spending that money to advertise for more kids to come through these systems, even though they’ve had record after record after record of failure, in many instances, by these charter schools. What we’ve also seen, in one of the biggest studies, was that more money goes to so-called administration in charter schools than to students directly. And that’s not a surprise when you see how these things are structured. Some of these charter schools basically outsource everything to the private sector. And then the private sector is not accountable to open records requests in Ohio, Indiana, other states, where people have tried to figure out where the money went. How much money went to executive pay, how much money went to these for-profit operations, you can’t even tell. JUAN GONZÁLEZ: Lisa, I want to play for you a comment by Reed Hastings, who is the CEO of Netflix. He’s a supporter and an investor in the Rocketship Education charter school network. Last year, at a meeting of the California Charter Schools Association, he called for the abolition of local school boards. His speech was posted on YouTube. The audio is not great, but if you listen carefully, you can hear his words. REED HASTINGS: And so, the fundamental problem with school districts is not their fault. The fundamental problem is they don’t get to control their board. And the importance of the charter school movement is to evolve America from a system where governance is constantly changing and you can’t do long-term planning, to a system of large nonprofits. Now, if we go to the general public and we say, “Here’s an argument why you should get rid of school boards,” of course no one’s going to go for that. School boards have been an iconic part of America for 200 years. And so, what we have to do is to work with school districts to grow steadily. And the work ahead is really hard, because we’re at 8 percent of students in California, whereas in New Orleans they’re at 90 percent. So we have a lot of catch-up to do. JUAN GONZÁLEZ: That was Reed Hastings, the CEO of Netflix and a big supporter and investor in the charter school industry, last year at a meeting of the California Charter Schools Association. Lisa Graves, your reaction, and also this whole issue of the long-term goal of eliminating any kind of democratic process for parents and communities in their school boards? LISA GRAVES: Well, if you listen closely to what he said, what he said was we need to abolish the school districts; we need to abolish the school boards, basically. School boards are really the only way that we have democratic control, direct democracy, over our schools. For ordinary public schools, if they want to build a new gym or a new stadium, they have to often go to taxpayers to get permission to expand the school system, to get taxes to expand. And also, people can elect who’s on that school board. What we see through charters and through the American Legislative Exchange Council’s agenda is an effort to circumvent local democratic control, to basically remove control of these schools, these charter schools, these often for-profit enterprises that are related to them, and that’s part of the design of them. When you look back at the history of this, what you see is the year after Brown v. Board of Education, when the Supreme Court unanimously ruled that the schools had to desegregate, Milton Friedman, sort of the godfather of the right on the economics, someone who has fueled and supported the American Legislative Exchange Council before he passed away—Milton Friedman suggested that the solution to segregation was that there ought to be just purely private schools. 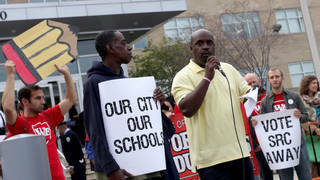 They ought to abolish public schools, and people could choose all-white schools, all-colored schools and mixed schools. AMY GOODMAN: Actually, we have a clip of the late economist Milton Friedman back in 2006 talking about the public school system should be eliminated. MILTON FRIEDMAN: How do we get from where we are to where we want to be, to a system in which parents control the education of their children? Of course, the ideal way would be to abolish the school—the public school system and eliminate all the taxes that pay for it. Then parents would have enough money to pay for private schools. But you’re not going to do that. And so, you have to ask: What are politically feasible ways of solving the problem? And the answer is, in my opinion, choice, that you have to change the way government money is directed. Instead of its being used to finance schools and buildings, you should decide how much money you’re willing to spend on each child, and give that money to the—provide that money in the form of a voucher to the parents of the children, so that the parents can choose a school that they regard as best for their child. AMY GOODMAN: So, that’s the late Milton Friedman, the economist Milton Friedman, speaking in 2006. And behind him is the banner of ALEC, the American Legislative Exchange Council. So if you can talk about the significance of this, Lisa, and also, you referred to ALEC, but explain exactly its role in all of this, as well as the Koch brothers? LISA GRAVES: So, you know, that was a speech to ALEC, as you point out. And what Milton Friedman was saying was basically the goal is to abolish the public schools. This is a radical, extreme goal, and it had been his goal since at least 1955. That goal has been joined by numerous billionaire families in this country, including the Koch brothers. When David Koch ran for vice president in 1980, one of his platforms was to abolish, privatize the public schools. You heard it in the last presidential cycle, in which the Republican candidates were competing for which agencies to abolish. They wanted to do abolish the Department of Education. I’ve heard Grover Norquist and others joke about the need to get rid of public education. This is part of that agenda. It’s also fueled by the DeVos family from the Amway fortune, by the Wal-Mart family, the Wal-Mart Foundation. All of them have basically wrapped their agenda in these words of “choice” that Milton Friedman suggested, that this is about choice, when, in fact, the agenda is hostile to the idea that there should be public schools. The radicals, basically, in the country, for a long time, including Fred Koch, who was David and Charles Koch’s father, believed that the idea of public schools was basically communist or socialist, which is really ridiculous. Public schools are one of the basic innovations of America that has made our country strong and great, to have universal public education for all kids. But what we’ve seen through ALEC is this combination of ideological right-wingers and for-profit entities and their trade groups coming together to actually vote as equals, behind closed doors, with legislators from across the country in this effort to privatize our schools, through vouchers, through expanded charters, through charters with very few controls, charters exempted from state and federal regulations, charters exempted from local regulations, charters exempted from control by local school boards. What happens at ALEC Education Task Force meetings—and that task force has been co-chaired in the past by for-profit corporations that benefit from this agenda, as well as nonprofits that outsource money to for-profits—those task force meetings, unbelievably, legislators actually vote as equals on those model bills with these special interest groups, before those bills are introduced in our state houses and state legislatures across the country. LISA GRAVES: And that’s one of the reasons why we work to expose ALEC. JUAN GONZÁLEZ: Now, Lisa, I wanted to ask you, particularly, the mention of Friedman about having the money in the form of vouchers per child, rather than for schools itself. You’ve talked about how in Wisconsin and other states now, you’re getting online private schools. And we’re talking not just in colleges. We’re talking in—at public school levels, charging, getting the same per-child fee as a normal public school would get. Could you talk about that? LISA GRAVES: Yes, one of the most amazing bills I read, after the whistleblower gave me the bills in 2011 that were approved through this corporate voting process of ALEC with legislators, was a bill called the Virtual Public Schools Act. It and other ALEC bills basically require that these so-called virtual schools, that would get vouchers or tax dollars, would be paid basically the same per-pupil amount as schools with bricks and mortar and air conditioning, blackboards, you know, lunch ladies, school buses, etc. The difference is profit. And so, you have a situation in which some of these vouchers are going to support operations that have far fewer costs, in part because some of these vouchers, at least in the virtual arena, are supporting schools or classrooms where there’s one teacher for 50, 60 or hundreds of students. And in some states, like Arizona, where they, through ALEC measures and related measures, have basically stripped down teacher certification rules so that you don’t have to have the traditional teacher certification, you can have uncertified teachers teaching, in so-called virtual classrooms, hundreds of students, getting thousands per pupil, and meanwhile, the corporations that are involved, like K12, are making millions of dollars. K12 has gone from a Wall Street firm that was created in part by the junk bond—Michael Milken, you know, his—that felon who was convicted for those junk bond schemes. He invested in K12. It’s gone from about $200 million in revenue to nearly a billion dollars in revenue. That’s almost entirely supported by federal and state tax dollars. And so, there’s enormous profit to be made through these vouchers.